"To develop an efficient chiller for buildings, finding the best pair -- a MOF [top] and a fluorocarbon [bottom] -- is a great challenge. This study guided us to understand the interaction mechanism between the host (MOF) and guest (fluorocarbon) to develop such pairs for designing better chillers," said Dr. Radha Kishan Motkuri, a material scientist at PNNL who has been working in porous materials area for the last 15 years. Results: Replacing the large chillers that cool hospitals, museums, and other institutions with more energy-efficient systems means using new materials. Scientists are interested in replacing the silica gel used in today's chillers with novel molecular materials made of molecular meshes or metal organic frameworks. The framework holds more refrigerant, making it more efficient. However, the precise amount of refrigerant held and the interactions involved were unknown. A team at Pacific Northwest National Laboratory (PNNL) and the University of Amsterdam determined-for the first time-how these promising frameworks interact with fluorocarbon refrigerants, possibly leading to better chillers. "We provided fundamental scientific answers about MOF [metal organic framework] interactions," said Dr. Praveen Thallapally, a materials scientist at PNNL who has worked with MOFs for decades. "We now have a basic understanding of MOF adsorption capacity, making it easier to compare them with other materials." Why It Matters: Keeping massive buildings cool over the course of a long, hot summer takes up large amounts of energy. Producing that energy creates carbon dioxide and other pollutants that can harm human health and the environment. If chilling systems were more efficient and used less energy, fewer pollutants would be released, and less energy would be used. "More efficient methods of cooling represent a great opportunity to reduce energy consumption in buildings, and in doing so, reduce greenhouse gas emissions as well," said PNNL Laboratory Fellow Dr. Pete McGrail, who is leading the research project. "The ARPA-E program represents a unique opportunity to move a recent laboratory discovery to the mainstream HVAC and commercial buildings marketplace in just a few years. It also opens up the possibility of completely new chiller applications, such as in automobiles and trucks, and thus opportunities to reduce fuel consumption." Methods: The research team began with two different MOFs to see how the internal structure of the framework affected the material's ability to adsorb a range of refrigerant molecules. A nickel-based MOF was chosen for its uniform pores, highly active sorbent sites, and internal channels. It is known as MDOBDC, where M stands for nickel and cobalt, and DOBDC stands for 2,5-dioxido-1,4-benzenedicarboxylate. MIL-101 was chosen for its hierarchical pore structure, meaning it has small and large pores connected in a specific arrangement. 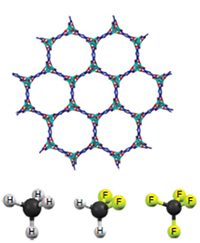 The team selected fluorocarbons, simple molecules made of fluorine, chlorine, carbon, and hydrogen atoms. They examined six molecules with varying numbers of chlorine and fluorine atoms, starting with methane, which contains only carbon and hydrogen, and ending with R12, which has two chlorine and two fluorine atoms surrounding a single carbon atom. Using experiments and computer simulations, researchers examined how two MOFs, MDOBDC and MIL-101, interact with refrigerants. MIL-101 with a hierarchical pore structure is slower at "hosting" R12 and other refrigerants but has more capacity than MDOBDC. Using a make, model and measure approach synthesized and performed, gas adsorption, solid-state 19F nuclear magnetic resonance spectrometry, and computer simulations, they examined how the solid MOF and the gaseous refrigerant interact. The nickel-based MOF has potential in sensors or other devices that need a material to effectively separate one fluorocarbon from another. The nickel-based framework quickly adsorbs R12. While MIL-101 with its hierarchical pore structure was slower to pick up the refrigerants, the team found it had far more capacity because it has a higher surface area than the nickel-based MOFs. "Unlike other gases, fluorocarbon adsorption studies are quite difficult because they are liquids at room temperatures. We succeed at designing and modifying the sorption system to accomplish the studies," said Dr. Radha Kishan Motkuri, a material scientist at PNNL who has been working in porous materials area for the last 15 years. With MIL-101, the material became more and more hospitable, hosting more refrigerant molecules, as the fluorocarbon's boiling point rose. This means R12 reacts more strongly than the simple methane because R12 has a higher boiling point. "The higher the boiling point, the stronger the interaction," said Thallapally. The team also found that MIL-101 is a bit particular about how it orients the guest molecules residing in its pores. For R12, which essentially has chlorine atoms on one side and fluorine on the other, the MOF puts the refrigerant in fluorine side in. This way, the fluorine is facing the metal center of the MOF. "Nobody has ever reported on this research before," said Thallapally. "We took on the challenge of putting all the data together and putting it in a conventional fashion for people to understand." What's Next? The team is continuing to examine the interactions between various MOF structures and fluorocarbons to develop best host-guest pair or pairs and test chiller designs implementing the materials. Sponsors: U.S. Department of Energy, ARPA-E Building Energy Efficiency Through Innovative Thermodevices (BEETIT) program sponsored Radha Kishan Motkuri, Harsha V.R. Annapureddy, M. Vijaykumar, H. Todd Schaef, Paul F. Martin, B. Peter McGrail, and Praveen K. Thallapally, Pacific Northwest National Laboratory; Rajamani Krishna, University of Amsterdam. Liem Dang's computational studies were funded by the U.S. Department of Energy, Office of Science, Office of Basic Energy Sciences, Chemical Sciences, Geosciences, and Biosciences Division.